Touch-screen and automatic functions simplify the workflow and increase productivity, making them crucial features in the HP Color Laserjet Enterprise flow M880z+ multifunction printer. Unlike its sibling, the Hewlett Packard M880z+ colour laser multifunction printer comes with built-in Wi-Fi capability for efficient direct printing from mobile devices, but it's more expensive than comparable colour MFP printer models from other brands. A minimalist design makes the HP Color Laserjet Enterprise flow M880z+ printer blend easily into any office environment. It features an 800x600dpi eight-inch SVGA touch-screen control panel with an extended keyboard and gesture support. This free-standing unit measures 704mm wide, 1199mm tall, and 635mm deep, and weighs 152.9Kg. There is an 800MHz processor and the memory is 1.5GB. Up to 4,100 sheets can be handled by the HP M880z+ Colour Laserjet printer with three input trays and a 100-sheet multipurpose feeder, while the output capacity is up to 3,000 sheets. Individual HP M880z+ toner cartridges help users print affordably with little waste. Each colour cartridge is capable of printing up to 32,000 pages. The print speed of the HP M880z+ is 45ppm in colour and monochrome. It's easy to operate the Colour Laserjet M880z+ because of the large touch-screen panel, and connectivity is simplified with standard USB host ports, Gigabit Ethernet, and mobile printing. The high duty cycle of the HP Laserjet Enterprise flow M880z+ MFP printer makes it suitable for bulk printing and large offices. Built-in finishing options simplify tasks like making booklets and brochures, or stapling documents. 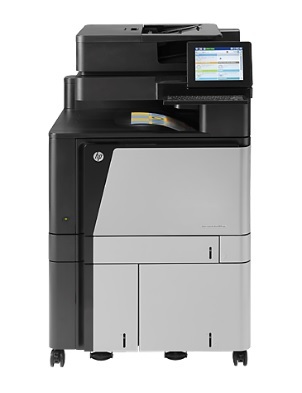 The HP Color Laserjet Enterprise flow M880z+ is easily upgradable and expandable to meet the demands of a growing office. The HP M880z+ colour laser printer is expensive, large, heavy and bulky. The fax modem that comes with the HP Colour Laserjet flow M880z+ MFP is slow and lacking in features. The quality of scanned documents and images might decline because of the 600dpi resolution of the scanner.